Clad in jeans, a blazer, and Converse sneakers, 30-year-old Dobry could be any young professional just getting out of work. But he's not. He's a pirate. Rodger Dobry sits in the downtown Erie Starbucks, venti white mocha in hand, debating whether to add a few extra sugar packets to the gently steaming brew. He strokes his auburn goatee with three fingers as he considers. Clad in jeans, a blazer, and Converse sneakers, 30-year-old Dobry could be any young professional just getting out of work. But he's not. 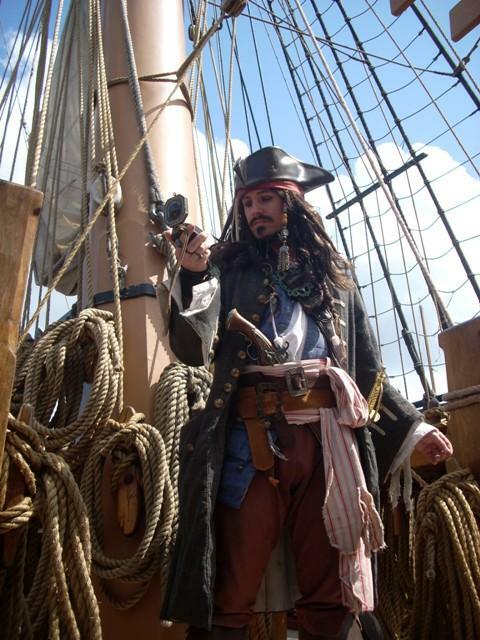 Well, if you want to get technical – Dobry is a Captain Jack Sparrow impersonator with the Lake Erie Pirates Costume Organization, as well as the organization's founding member. He doesn't plunder or pillage. He doesn't carry a pistol around with a single shot. He just loves the history of pirates and teaching people about them. But don't dismiss Dobry as just another guy playing dress-up – when he puts on the tiny beard braids, pops in the brown contacts, dons his wig ($150, handcrafted) and his hat ($250, custom-sized, made of seamless formed leather) – among countless other costume items, including a bandanna that was actually made for the real movie – you can tell he's dedicated to making his look as authentic as it gets. "The moment I go into character is the moment the wig goes on," he said. "Don't ask me why… the second the wig goes on is the second it goes. It's hard to turn off at that point." "And a little rum doesn't hurt." But why the interest in pirates? Their history. Dobry, a Waterford native, said he's always been a history buff. His uncle got him involved with Civil War re-enacting when he was 12 – "I went for one week, and I was hooked," he said – and he continued the hobby for the next 13 years. Dobry played the fife and drums with his unit until he turned 16 and was allowed to re-enact while carrying a firearm. He's also had a love of performing since his younger years, too – Dobry's mom was very involved with theater when he was a kid, and encouraged him to perform in school plays, events at First Assembly of God and the Station Dinner Theater. Dobry simply loves anything performance-related – he's played the guitar in a few bands, and he's known to rock a karaoke microphone (His go-to karaoke? "Stray Cat Strut" by The Stray Cats). With a love of history and pirates, does Dobry think they get a bad reputation? "Rightly so," he said. "They were nasty, mean, cutthroat killers – illiterate fools." Dobry noted that Hollywood was the first to paint pirates as "valiant, rogue swashbucklers, fighting for freedom" – a lifestyle that makes for an awesome fantasy, but not so much as a moral compass. He described the Lake Erie Pirates' goal this way, accompanied by a charmingly goofy double-thumbs-up and a grin: "Hey, kids! Pirates may be cool… but… you don't want to grow up and be one." Dobry's stint as Jack Sparrow began in 2004. He was working at Hot Topic, and they were allowed to dress up for the whole month of October. Since the "Pirates of the Caribbean" movie was white-hot at the time, he figured he'd dress up as its swashbuckling, rum-drenched antihero: Captain Jack Sparrow. Dobry thoroughly researched the character. He read countless interviews with Johnny Depp to see how he came up with Jack's persona. He, of course, watched the movie. To make the outfit, Dobry combined the store-bought costume with some of his old Civil War re-enacting items. He went into work and was a smash hit. "People were coming into the store just to get pictures with me," he said. "And my boss is like, 'Get back to work!' But, you know. It went over really, really well." Then Halloween was over. But he held onto the costume – having a history in acting, he was taught never to throw away costume stuff because you never know when you'll need it again. "I think I still have a pair of rainbow suspenders that I used in a show when I was 15 or something," he said. "They're in a box somewhere." He brought Jack back during a trip to the Great Lakes Medieval Faire in the summer of 2006 during Pirate Weekend – and, apparently, about 20 other people had the same costume idea. "An interesting thing happens when you meet somebody at a comic book convention, or a fair or something like that when you're dressed as the same person," Dobry said. "You get two types of people: You get the person who just kind of scoffs and walks away and says, 'Oh, I'm so much better than you' – or you get the person who walks over and says, 'Oooh! Where'd you get that? Where'd you get this? Who made that?' And that's the type of person I try to be." After gathering a few ideas for the next phase of Captain Jack, Dobry found himself in a surprise competition with the throng of Jacks, who were all rounded up in the fair's "jail" in what they deemed "The Caging of the Sparrows." Each Jack had to stumble out of the cell and give a speech to the increasingly large crowd convincing them why he was the "real" Jack Sparrow. The winner, chosen by the cheers of the audience, got to be set free. After his victory, a hired performer at the fair came up to him and suggested he start impersonating Jack at birthday parties. When he returned to Erie, Dobry cold-called party company Jungle Express and asked them if they'd like to add Jack to their lineup of on-call characters. "They said, 'Come in, do your best Jack Sparrow and we'll talk,'" he said. (How's that for a job interview?) "I went in and they pretty much hired me on the spot." Dobry's Sparrow character is so spot-on – the slur, the rolling eyes, the movements – he was interviewed for a yet-to-be-published book about the top 20 Jack Sparrow impersonators in the country. When Dobry talks about pirate life, you can almost smell the sea salt and rum in the air. I think I spotted a patch of barnacles inching around his Starbucks cup as his blue eyes flickered with pride at the mention of his loyal crew. The Lake Erie Pirates formed in December 2006, when Dobry, still prime with momentum from winning the Caging of the Sparrows contest, convinced his then-roommate Dave to join him in pirate garb for gigs. He garnered more support, and by March 2007, the "original eight" were out and about, entertaining and educating audiences at places from the Steel City Con to Stairways Skate Night to the Walk for Autism. "It's not just, 'Hey, we're a bunch of pirates!' It's, 'Hey, we're a bunch of pirates – come here and learn something," Dobry said. "People don't even realize they're learning something about history." These days, the crew has grown to encompass 22 members – the youngest of whom is 5, and her mom is in the group. "She dresses in a little pirate lass dress," Dobry said. "She looks adorable." The Lake Erie Pirates even has three "honorary members": Vanessa Branch, Lauren Maher, and Martin Klebba, who were actual cast members in the Pirates of the Caribbean movies. Dobry got to meet all three of them. "It's almost humbling, in a way, because it started with just a couple of friends who just wanted to dress like pirates and have fun," he said. "And now, we're this well-known organization that is so in demand that I have to turn people away sometimes because we're booked. It's just like, 'Wow.'" When Dobry is clad as Jack in his $1,000-plus costume, the ladies tend to swarm over his, ahem, booty – and sometimes Captain Jack has to flash his one piece of real bling: his wedding ring. Dobry has been married to his wife, Emily, for three years – the pair met almost eight years ago when he was working at Hot Topic. He was wearing a Green Day shirt. She was also a fan and struck up a conversation. "She came in one day and hit on me," Dobry wryly puts it. "It was one of those, 'Hey, do you want to hang out sometime?' 'Sure!' Exchanged numbers – now, we're married! It's kind of funny. You never know." But how does his wife feel about his piratey pastime? "She's good at reeling me back to reality now and then," he said. "You've got to have that anchor – and she's that for me." As for Dobry? He doesn't plan on stopping the pirate life anytime soon. "There's something romantic about it," he said. "It will last as long as there are new adventures out on the horizon." You know you?ve made it in the film industry when a line from your first commercial success makes the American Film Industry?s list of the top 100 movie quotes of all time ? a list compiled just five years after its release. The GAA is big ? so big, in fact, that it can?t be confined to just one day! Clip and save this handy guide to the GAA goings-on as you join Pennsylvanians from across the state in navigating an entire week of pre-celebrations as well as an afterparty that is not to be missed. Erie?s no stranger to art festivals. Heck, the dust from Erie?s notorious Chalk Walk is still faintly visible on State Street, and strains of the Erie Art Museum?s Blues and Jazz Festival can still faintly be heard blowing through the wind. But the upcoming Pennsylvania Governor?s Awards for the Arts ? with a week of county-wide celebrations slated to begin on Sept. 16 ? is in a league all its own. She?s a disco diva, actress, Philadelphia native, and Distinguished Artist Award recipient in the 1998 Governor?s Awards for the Arts ? and she also makes a mean sesame chicken stir fry. Whether you?re running in time with your iPod, dancing in the front row of an 8 Great Tuesdays concert, or cruising home from work and cranking a well-worn CD, your favorite music moves you. Let?s face it: we?re not all called to be novelists or published poets. But when we can?t shake an image or a phrase or a feeling from our heads, we turn to our tattered notebooks and beloved Moleskine journals or even bar napkins. Humans are communicators through language by nature, and finding just the right way to say what we want to say can be an art form.